Bangkok, 21 March 2015 (NNT)- The Government is ready to provide support for the halal business and industry in the southern border provinces, where the Muslim population is substantial. Deputy Prime Minister and Defense Minister General Prawit Wongsuwon raised the issue of halal development and promotion for discussion during his inspection of the Halal Industrial Estate in Panare district, Pattani province, on March 19, 2015. General Prawit quoted Prime Minister Prayut Chan-o-cha as saying that he would like to see significant progress of this industrial estate, which was established in 2004 on an area of 173 rai, or 68 acres. 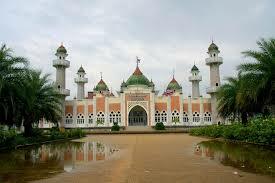 The Halal Industrial Estate is operated by the Industrial Estate Authority of Thailand. A one-stop service center was also built within the area to promote business and marketing and for certifying the Halal-GMP/HACCP standards, in addition to providing various other services. The manufacturing of halal food here is based on Good Manufacturing Practice (GMP), Hazard Analysis Critical Control Points (HACCP), and other health standards. Unrest in the deep South erupted in early 2004 and it has slowed down the implementation of this project, especially in terms of infrastructure development. General Prawit said that the Army Engineer Department had been entrusted with building a 2.8 kilometer-long road leading to the entrance of the Halal Industrial Estate. He believed that this industrial estate would generate many employment opportunities for local residents, as halal products and services have become more popular and bright prospects are seen for export. In particular, when the ASEAN Community is in place in late 2015, Thailand is likely to export more halal food to ASEAN countries, where half of the ASEAN population is Muslim. Pattani province has adjusted its management plan on halal development and promotion by focusing on encouraging local manufacturers to be aware of the importance of certifying halal standards. It has also urged local small and medium-sized enterprises (SMEs) and community businesses to join the Halal Industrial Estate. In its provincial development plan, Pattani has set to become a source for agricultural produce and halal products of high quality. Also on March 19, 2015, the Committee on the Development and Promotion of Halal Business and Products, chaired by Deputy Prime Minister M.R. Pridiyathorn Devakula, approved strategies and projects to be carried out from 2016 to 2020 to enhance the potential of halal products and services. Among these projects is the development of halal restaurants in the five southern border provinces, namely Yala, Pattani, Narathiwat, Satun, and Songkhla. Meanwhile, Secretary-General of the Southern Border Provinces Administrative Center Panu Uthairat said that, apart from emphasizing the certification of halal standards, the promotion of the halal business in the deep South in 2015 would also focus on halal marketing and the creation of new halal entrepreneurs to cope with the expected growth of this business.